If you are looking for a professional building designer or drafting service, look no further than Precision Planning! Our team has extensive experience across Sydney, and even rural New South Wales. 15 years of experience and a collaborative approach has given Precision Planning an edge in preparing detailed and personalised plans. Whether a commercial suite, or your dream home, we are ready to get designing, and drafting! Years of experience and expertise, especially with Inner West, Northern Beaches and all of Sydney’s Shire and Valley Councils have developed in to a passion and desire to prepare meticulously drafted and detailed plans. We use 3D modelling software to assist with accuracy and visual representation. The key to any successful home extension or renovation project is communication and collaboration with your building designers. It is important to work with a company that has a good reputation, not only for beautiful finished work, but for how they handle every step of the process. Communication is key to every aspect — the layout, aesthetic, liveability and compliance. It’s a lot to keep track of, but you don’t have to — our team knows what needs to happen at every step and we will work with you to make sure everything runs smoothly. Sydney is a unique area, with a very rich history – resulting in unique localised controls, and we can help you with all the behind the scenes things you need to do —like perfecting a design and submitting a development application package to your local council. A draftsman? A building designer? What is the difference? If you want the project to go smoothly, you should work with a qualified and experienced professional. Precision Planning does not just hold the skills of a draftsman, we are building designers who are technically and design orientated, and have deep knowledge of construction materials and design standards. Our building design and drafting services produce workable construction plans that communicate to Councils, builders and contractors what is required. 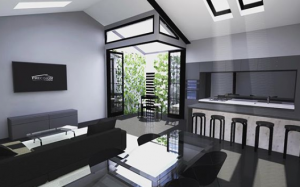 If you are renovating your home in Sydney or surrounding area, and are at the initial thoughts and conceptual stage of your project, now is the time to find someone to do your building design and drafting for building approval. We create drawings that incorporate your ideas into a cohesive design and make recommendations about materials, finishes and colour schemes. We even offer services in interior and landscape design. Precision Planning takes extreme pride in the quality, calibre and production value of our architectural design and building plans and overall service. There is a strong investment in to the time required to produce a functional design, and to evolve the design into useable DA and construction-ready plans. We know it can be overwhelming, especially if you are a first-time renovater. We currently offer a complimentary consultation and meet-and-greet at the property (local projects). Get in contact with us now & be sure to provide enough information so we can address your queries efficiently! Planning to Build or Renovate?